In early February, a former Birkbeck undergraduate student was convicted for terrorist intentions. Last year in May, en route to Serbia, David Souaan was arrested at Heathrow airport on suspicion that he was going to fight in Syria. His case was minor, nevertheless, the former student is serving a three-and-a-half-year sentence. Souaan exemplifies a phenomenon worrying communities and challenging the government: radicalisation, or the process by which a person comes to support terrorism. At Souaan’s trial, the court heard that his young age and immaturity made him vulnerable to extremism. The transition from kind-hearted member of the community to potential national security threat is more common in young people, according to a review published by the government. As many young people study in higher education, universities are under pressure to prevent radicalisation. The counter-terrorism and security bill, which will soon become law having received royal assent, will require internet providers and airliners to retain data, cancel passports of suspected national terrorists, and place universities, including schools and colleges, under statutory duty to prevent the radicalisation of students. Most universities already follow a counter-terrorism strategy set by the government. Aptly named Prevent, the strategy recommends ways to spot extremism to universities and other public bodies. The strategy was revised in 2011 when al-Qaida was perceived as the biggest threat to national security. Now the threat is Da’ish, or Islamic State (IS), and ‘start-up terrorists’. The government blames universities – specifically vice-chancellors – for being relaxed about extremism on campuses, while others argue universities are overly cautious in following the Prevent strategy. Birkbeck has been criticised for cowering to police rather than representing the interests of the staff and students. Late last year Birkbeck cancelled a conference on Islamophobia after receiving threats from far-right organisations Britain First and Casuals United. The Islamic Human Rights Commission had hired a classroom for the daylong seminar but the event was pulled at short notice. “It is unfortunate that the circumstances surrounding this conference changed,” Birkbeck stated. “Not only was there a significant primary threat of disruption and a genuine threat of counter demonstration, but there was also the potential of an escalating situation given the location within the Bloomsbury university area. They further criticised Birkbeck and the Prevent team for not having supported community groups against extremism. Activists, academics and students fear the foundation of the university as an institute for the freedom of expression will soon also become a nostalgic memory. When the counter-terrorism bill becomes law, the foundation of the university will include the duty to prevent extremism. Universities are to be categorised along with charities as public bodies with the public interest and safety as their principle mission. 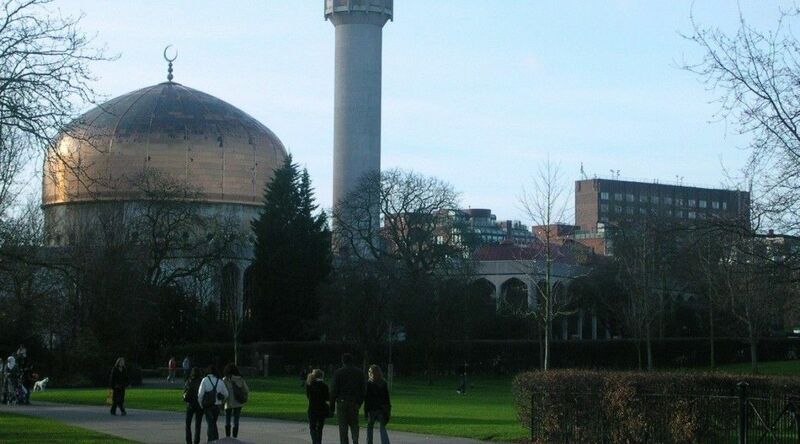 The division of social integration and counter-terrorism attempts to alter the role of universities as well as the Muslim community. With the unmasking of ‘Jihadi John’ reportedly as Mohammed Emwazi and reports of three London school girls travelling to Syria, along with a number of other cases including David Souaan, the government continues to link the rise in extremism with a failure on behalf of Muslim communities. David Cameron called on the Muslim community to challenge the ideology of IS and actively prevent extremism. The Prime Minister and other national leaders are of the opinion that this new terrorist group has manifested from a religion uncritical of the violent minority of its followers. The government has challenged Muslims to prove their nationalism. Mohran and the president of the Society, Yusuf Zakaria, believe IS is not alone in abusing the teachings of Islam – the British government and the media do as well. He gave the example of how dawah – opening dialogue to teach Islam – has been linked to the act of killing, such as with the murder of Lee Rigby. “They are implicating a whole bunch, a quarter of humanity, that are devout followers of a religion to a bunch of nut-jobs who just want to go out and do some evil stuff,” Mohran said. The theory of radicalisation is also ambiguous. For such a complex process, it is often reduced to deceivingly simple terms. Cameron has used the analogy of a “conveyer belt”. This brings to mind the image of a young student going through a machine marked ‘terrorism’ and coming out as a balaclava executioner. The Home Office have neither confirmed nor denied that MI5 attempted to recruit Emwazi. Other critics see both interpretations of radicalisation as one-sided: they do not factor in other contributing elements such as British foreign policy and the fragile state in the Middle East. For all of the thwarted plots Home Secretary Theresa May has boasted before, recent debate in the government has focused on the management of intelligence agencies and their failure to prevent crimes related to terrorism. They have been criticised for not monitoring closely Lee Rigby’s killers, Emwazi and the three travelling London schoolgirls. The counter-terrorism bill was not required for the authorities to become aware of David Souaan. Nor was it by using the Prevent strategy that the former Birkbeck student was flagged up. By their own volition, students informed the authorities about David Souaan, concerned about his extreme views. “Hello from Syria” Souaan texted to a friend at the start of last year. 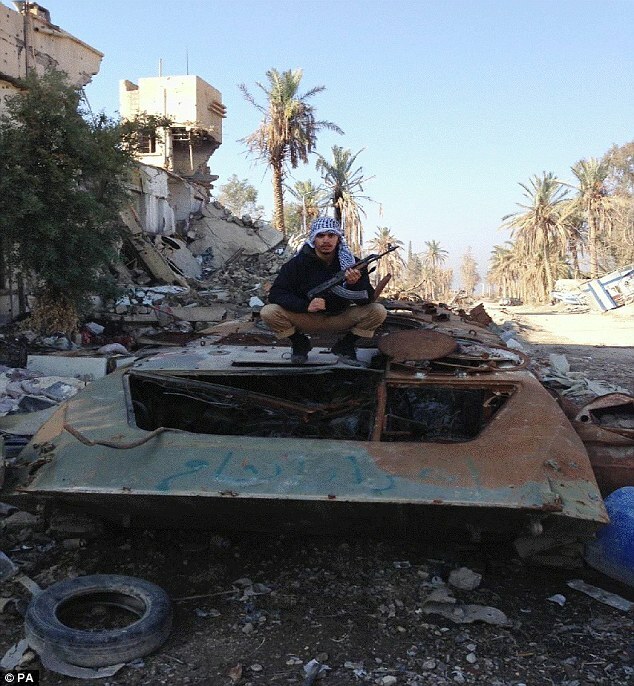 Squatted on top of a shelled, destroyed tank, Souaan faces the camera wielding a machine gun. He is the only person in the picture. There are palm trees behind, blue sky above and rubble about. The battle seems to have moved on – Souaan late on the scene. The photograph was taken January 2014 when Souaan travelled to Syria. At his trial he told the Old Bailey the reason for his trip to Syria was to help collect his grandfather’s belongings after Assad forces fired rockets at the family’s hometown of Deir ez-Zor. The prosecutor, Sarah Whitehouse QC, told the court Souaan’s friends might have exaggerated the photos he had shown them, but further evidence supported he was preparing for terrorist acts. When Souaan was arrested at Heathrow, police uncovered documents on his laptop and smartphone revealing his “extremist sympathies”. One such document was a video clip of a man slitting the throat of another. Other footage reportedly showed Souaan at a demonstration in the UK calling for the flag of Tawheed, used by IS, in London. Along with text and Skype messages, all this evidence suggested Souaan’s record of “extremist sympathies” equated to extremist activities. The increasing influence and power of IS, and Western withdrawal of support for Syrian rebel groups likely factored in the jury’s verdict to find Souaan guilty of terrorist activity. Souaan’s lawyer Ali Bajwa QC described the defendant as experiencing “loneliness and isolation” from family when studying Global Politics and International Development at Birkbeck. The homesick student was “emotionally immature and naïve,” Bajwa said. The UK is not Souaan’s native country. His home is Serbia where his Christian mother was born – his Muslim father is Syrian. It hasn’t been that long since Souaan was a teenager. He is 20 years old. He is serving a three and a half year sentence at a young offenders institution. Carson Arthur is currently studying BA Journalism & Media at Birkbeck. He is interested in social issues, in particular housing and writes on the subject at www.thisistoscale.blogspot.co.uk.